Diffusing any notion of a stuffy wedding to follow, cocktails and billiards at a local dive bar created the scene and set the stage for these wide, full smiles by the bride and groom. The wedding day began at the Maxwell Hotel in the Lower Queen Anne neighborhood of Seattle, with coiffing, brushing, dressing and prepping. 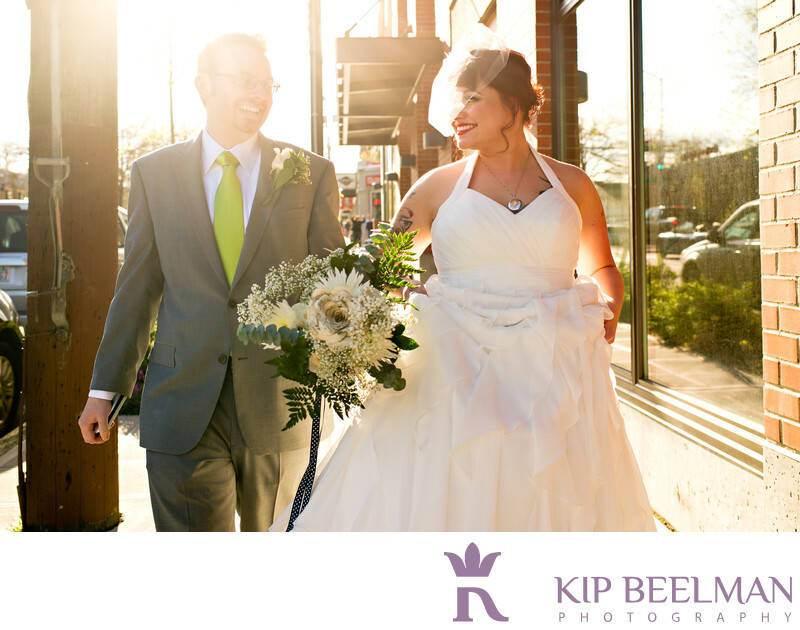 While later strolling the streets of the Greenwood neighborhood, the wedding party easily entertained themselves at the Baranoff dive bar with pool, cocktails and easy conversation, creating a contemporary background for these first wedding photographs. Urban Light Studios wedding photography provided an artistic opportunity for pictures in an eclectic architectural and event space that is touted as an “artistic speakeasy.” The ceremony and reception site welcomes guests with a long hallway that guides them off the street and into a brand new world of brick lines, light, surprises and quirky design. After the celebration of the ceremony, the Lighting Booth was commissioned to operate a one-of-a-kind photo booth experience for guests downstairs. Images were recorded and then beamed upstairs to the main reception area for the guests to enjoy. It was all fun and games until images of two naked men began appearing on the screen to a combination of uproarious laughter to most and dismay to a few. Location: 8537 Greenwood Ave N Suite 1, Seattle, WA 98103. Keywords: Hall Wedding (21), Seattle (111), Urban Light Studios (3).